As a foreigner, you shouldn't miss to taste the original apple wine in an original applewine-pub. 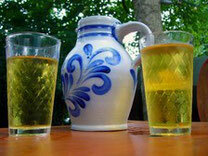 The applewine will be served in a Bembel - the typical applewine-jug. It is said to be a refreshing drink, with not too much alcohol, that doesn't make you tired. This is the reason, why people like to drink that much of it. Frankfurt has a different charm in the evening. This tour covers both sides of the River Main. Just across the River Main from downtown Frankfurt lies the city's beloved apple wine district of Sachsenhausen. 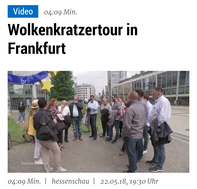 Start: Please note that the meeting point for this tour is in the historical part of Frankfurt.